This recipe is from The Silver Palate Good Times Cookbook published in 1984. We like this recipe for potato salad with the addition of fresh dill, scallions, carrots and parsley. Heat a medium saucepan and bring it to a boil. Cook the potatoes 20-25 minutes until tender. Drain, cool and cut in half. Combine the eggs, potatoes, carrot and scallions in a large bowl. Add the dill, parsley, caraway seeds, salt and pepper. Toss gently to combine. Mix the sour cream and mayonnaise and gently fold into potato mixture. 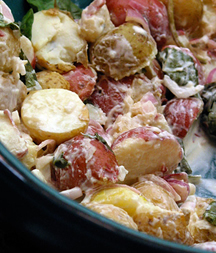 Cooking tip: When my friend makes this potato salad she adds the seasonings into the sour cream and mayonnaise. She says it takes less tossing so she is less apt to break up the potatoes and she says it distributes the flavors better throughout the salad.